The SunTrust branch located at 1901 US Highway 27 in Sebring will not reopen after five women were shot and killed when a gunman opened fire inside on Wednesday. 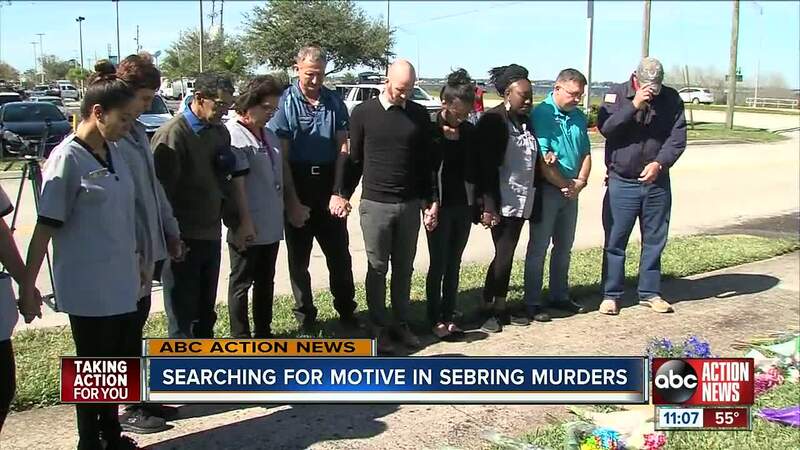 SEBRING, Florida — The SunTrust branch located at 1901 US Highway 27 in Sebring will not reopen after five women were shot and killed when a gunman opened fire inside last Wednesday. Four employees and one customer lost their lives in the shooting. Cynthia Watson, 65, was the only customer inside the bank. Tony Watson, her husband, said they were married just 23 days ago. He said she was, "was very hard working, she never stopped and she took care of everyone." Marisol Lopez, 55, was an employee at the bank. Along with 38-year-old Ana Piñon-Williams and 31-year-old Jessica Montague. Williams was a new employee at the bank, her brother-in-law said. Her husband dropped her off at the bank just 16 minutes before the shooting took place. "We're determined to let Ana's memory be marked by the life she lived. The people she loved and the difference she made," Williams' brother-in-law Tim said. "She accepted others where they were in life. Loving came easy for her. Loving her was easy." Montague just celebrated her first wedding anniversary earlier this month, her husband Jermaine said. He also told us the shooting took place on his birthday. "We celebrated our wedding anniversary on January 1st. My birthday was the same day of this incident," Jemaine said in a statement. "She was the greatest woman, mother and wife that I knew, she bent over backwards for anyone. And she had the greatest relationship with her mom." The fifth victim was 54, according to Scott Dressel, the Public Information Officer for the Highlands County Sheriff's Office. The remaining victim's name is being withheld in accordance to Marsy's Law, which protects crime victims and their families.